Figure 1: A mastodon skull. Notice, the hole in the center of the skull. This is where the large trunk (nose) was attached. A skull like this seems to have been the source of legends of cyclops. Image you are living in 200 BC in the Middle East and you come by the skull to the right (Fig. 1) as you plow your field or when you explore the local cave complex. What if you are wandering the desert in Egypt and happen upon the bones in the second figure. Or what about the skull in the third figure? What if you came upon the jaw of a dinosaur (Fig. 4) in the sandstone rocks? What would you think? What would you think they came from? Surely you would think they came from something that had been alive because you are familiar with the dried bones and skulls of cows, water buffalo, and possibly even lions. But these are so much larger than anything you have ever seen and have many odd features. Despite this, depending on the shape of the bones you undoubtably would attempt to create in your mind an imagine what the organism must have looked like when it was alive. must have come from a very large organism. A huge human like thing with a single eye possibly. Sounds like the mythical Cyclops. But if the Cyclops was imagined from these bones is the Cyclops really a myth? Not to those believed the bones to represent a real organism. 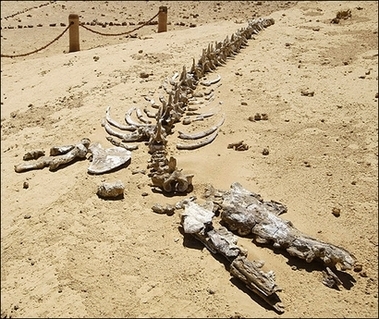 And what of those massive skeletons found lying about in the Egyptian desert? 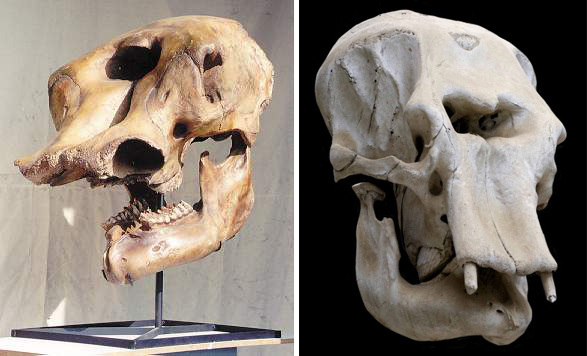 And what about that skull of a huge animal in figure 3. In each case the bones are absolutely real and they must be the remains of a formerly living things. When did the organism that gave rise to these skulls and bones live? 2000 years ago had you stumbled upon these bones would you believe they lived hundreds of thousands of years before or even hundreds of years before? Or would you expect that they could have died very recently. And if they died in the past couple of years could there not be others like them still alive in your day? Your friends have caught glimpses of large creatures or they have heard stories of creatures from lands far away. You infer these must be the remains of those animals from those stories you are staring at. 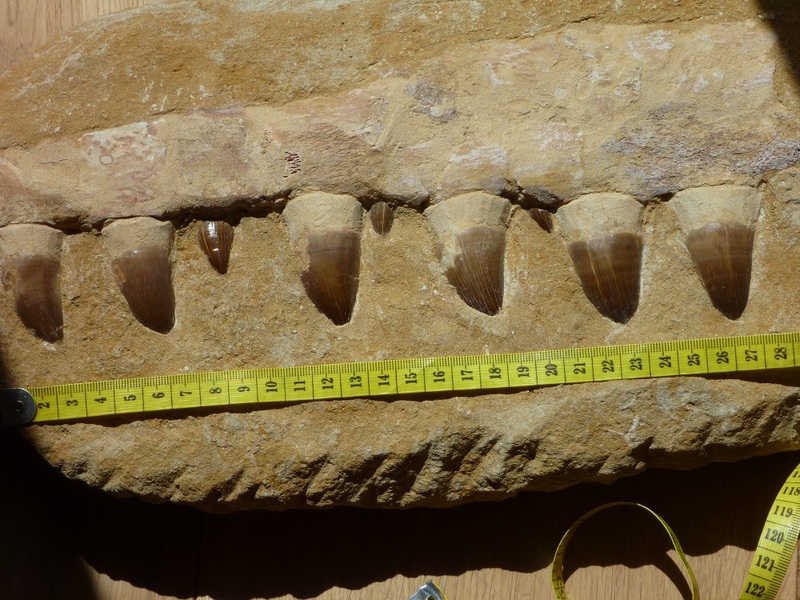 Figure 4: Jawbone of a dinosaur with teeth from the Moroccan desert. This specimen has been prepared and the teeth likely straightened or replaced but nonetheless jaws with teeth such as this are not uncommon finds and would evoke a natural desire to wonder what the organism looked like that had such large teeth. So then are the griffin, the cyclops or the dragon simply mythological creatures or are they as real as the lion, the elephant, or rhino? Yes, they are as real in your mind as any creature that you may have seen with your own eyes. The dragon exists nearby because you have seen his remains. The Cyclops exists because you have seen his head. The griffin has the trunk and legs of a lion, the head of an eagle and wings and stands guard over deposits of gold because the bones of a griffin are observed in rocks very near to where gold is dug up in southern Asia. All of these creatures were very real to the ancient mind that had no concept of fossilization, vast periods of time or the extinction of organisms. What I have just presented to you is the thesis of Adrienna Mayor, a research scholar affiliated with the Stanford University Department of Classics. Author of numerous research articles she has also authored several popular books that examine the origins of myths and folklore. 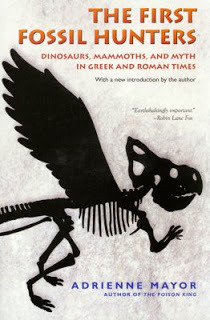 Her most influential book is The First Fossil Hunters: Dinosaurs, Mammoths and Myth in Greek and Roman Times. New edition released in 2011. I was reminded of Mayor’s description of the literal origins of dragon myths when I read Georgia Purdom’s (Answers in Genesis) response to a critical review (see: A Seminary Student Visits the Creation Museum: 27 Million Dollars of Bad Exegesis) of the new dragons display at the Creation Museum in Kentucky. Ken Ham approvingly pointed to her response on his more visible blog a few days later. The seminary student had employed Mayor’s work as a reasonable alternative explanation for reports of dragons in history and provided a number of other reasons why Ham’s vision of dragons as dinosaurs was neither scientific nor consistent with the scriptural evidence. Purdom’s response is not really much of a defense of Ken Ham’s vision of dinosaurs and dragons. She is utterly dismissive of Mayor’s thesis. Her response, below, is to simply borrow Ken Ham’s favorite expression “were you there” and insinuate that Mayor’s views of the age of the earth make her conclusions suspect. I can only conclude that Purdom has not read Mayor’s book. The detail in that book is astounding but more importantly the conclusions she draws have little to do with a presumption of evolution and millions of years. For Mayor it would not matter if the fossils and bones were interpreted as having been laid down 4000 years or 4 billion years ago. If ancient peoples looked at bones and interpreted them as representing creatures living in their time, then time and evolution is of no importance. Young earth creationists should be able to readily accept the conclusions of Mayor. The only reason, it appears, that Purdom has any trouble with Mayor is that Answers in Genesis seems to have already decided the truth about dragons existence and are bent on promoting a dichotomous choice: dragons were either absolutely real and lived beside man or dragons never existed and are completely mythological. Mayor proposes a third, and much more likely option: dragons were conceived of as real creatures and believed to be real. They were not a made-up legends nor did anyone who originally believed in dragons believe they lived millions of years ago. When the Bible and other cultures talk about dragon-like creatures it speaks about them as if they are real because, by all indications, they absolutely were real to the original audience. 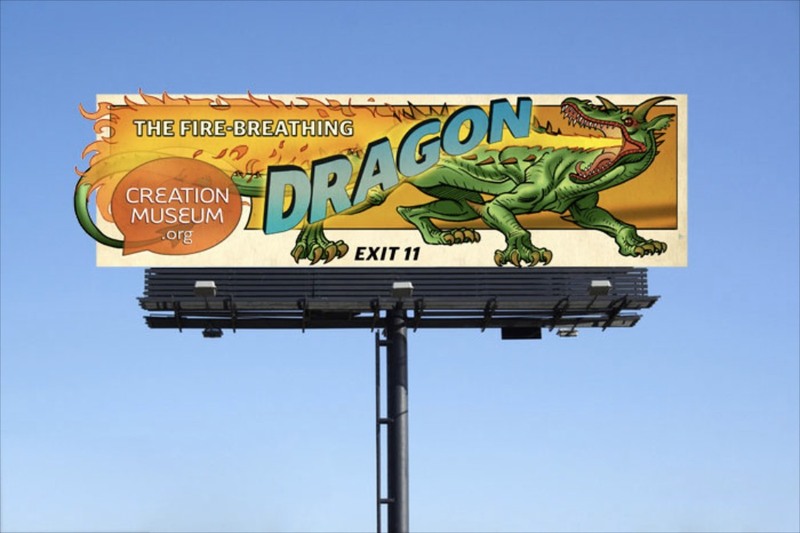 Ken Ham’s Creation Museum has little use for this form of literalism. For them a description of behemoth in the Bible must be a dinosaur and it can’t just be a dinosaur from bones but one that people had to have seen with their own eyes. Ken Ham would have us believe that any mention of dragons or any image scrawled on a wall that looks like a dragon absolutely must represent an eyewitness account of living dragons or dinosaurs. Did dragons exist in the past? Yes and No. I don’t believe there were fire-breathing flying dragons at any point in time though there have been creatures that have had some of the features of dragons. However, people almost certainly encountered massive bones from extinct organisms that they understandably interpreted as representing the remains of organisms living in their day. Yes, they really believed dragons, griffins etc.. were as real as any other animal that they knew. As further evidence, Mayor documents a widespread phenomena in the Mediterranean region from around the time of Christ. At that time many villages in the Mediterranean had collections of “hero” bones which were mostly large mastodon and mammoth bones and tusks that had been found in areas around the towns and they were preserved as the remains of animals and even giant humans that lived in the recent past in that area and were thought to be the areas protectors (its heroes!). Over time the attributes of these heroes and stories of how they died and where they lived were almost certainly embellished thus becoming far more mythic in nature but nonetheless these myths were grounded in a belief in the literal reality of their existence. I should note here that Adrienne Mayor has also written a second book about Native American legends (Fossil Legends of the First Americans) in which she argues, I think quite persuasively, that they also encountered many bones of extinct organisms and they also interpreted these bones as literally representing many of the organisms that become what we think of as legends but were born out of real encounters with real organisms albeit the remains of those organisms. A search of the Answers in Genesis website reveals only one other mention of Adrienne Mayor and that is with respect to a story out of China about dinosaur tracks and some confusion that led some to think that there were dinosaur and human tracks together there. Adrienne Mayor was part of that study and interestingly the AIG report tells the story of how those dinosaur tracks have been known by Chinese for thousands of years and that ancient Chinese thought that these tracks looked like lotus leaves and had developed a number of stories to go along with these “tracks.” What of the many dinosaur tracks that are in China? If you were a Chinese peasant in the year 400 and came upon what looked like huge tracks of a reptile in the rocks and you knew nothing of geology would you not imagine that they were formed by some great beast that walked that way in the not too distant past. What about pterodactyl fossils found in China that have obvious evidence of huge wings? 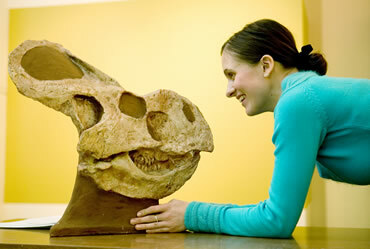 Or, more likely, what if you found a theropod dinosaur claw (see image below). Would you not imagine what animal this claw belonged to might look like? Would you assume that animal were extinct? Probably not. That Chinese should have legends about dragons is not surprising and has nothing to do with an old earth or evolutionary worldview. Those legends come from explaining something that was very real and yet the reality of those bones and footprints doesn’t mean that dragons as they are portrayed in Chinese literature are an accurate reflection of what those bones represent or that dragons may still be alive in the inner forests of China today. 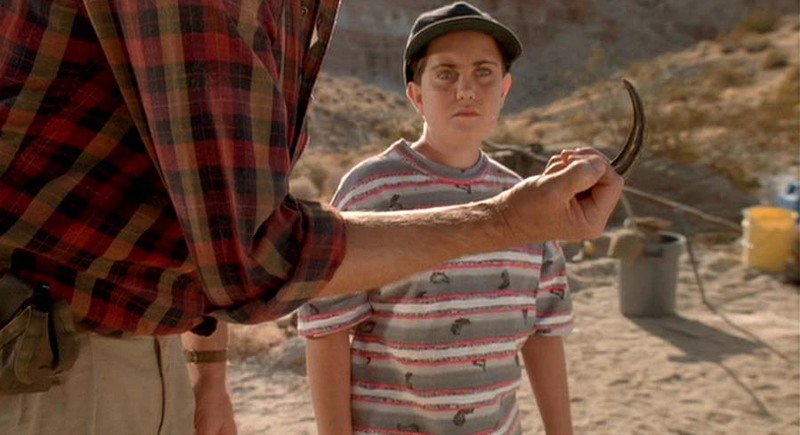 A raptor claw as shown in this screen shot from the movie Jurassic Park. Man-made Hunting Structure Under Lake Huron: A North American Doggerland? Walking Whales On Board Noah’s Ark: The Inevitable End-point of Creationists’ Post-Flood Hyper-Speciation Belief?